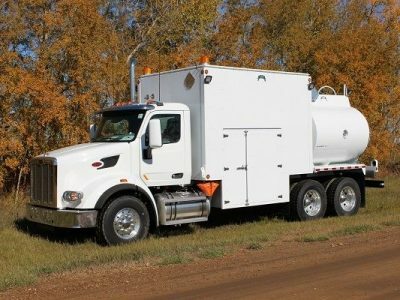 2017 TANDEM LUBE FUEL TRUCK - Wabash Mfg. Inc. 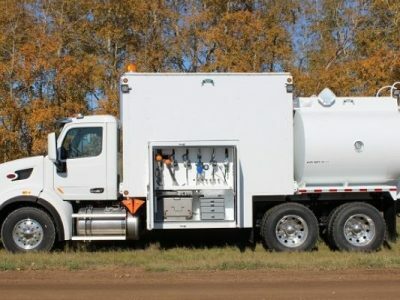 Contact 780-349-4282 for more information on how you can have this unit custom built for you or email sales@wabash.ca. The lube van floor serves as secondary containment reservoir to ensure no environmental contamination. Raised safety strut walkway is removable for easy service access. 30″ access door and grease barrel storage are both conveniently located on the curbside. Clean filter storage rack above the oil tanks at rear of van. Dispense cabinet with hose reels on street side. American Eagle Toolbox on lower right portion of the dispense cabinet with 500 pound slides. Used filter bin lower left portion of the dispense cabinet has slide out made of stainless with hinged lid. Diesel fuel dispensing from Blackmer 2.5″ sliding vane pump with strainer and trunk kit. The lube van is heated by (2) Espar Airtronic4 heaters. All work lights and cabinet lights are LED. Complete electronic owner manuals are included. Tandem chassis equipped with Tuthill Hydraflow hydraulic cooler and Chelsea PTO for the Allison Automatic Transmission. Also included is Espar diesel fired coolant heater to keep this Peterbilt Cummins ISX12 425 engine temperature proper when idling in our extreme cold weather.